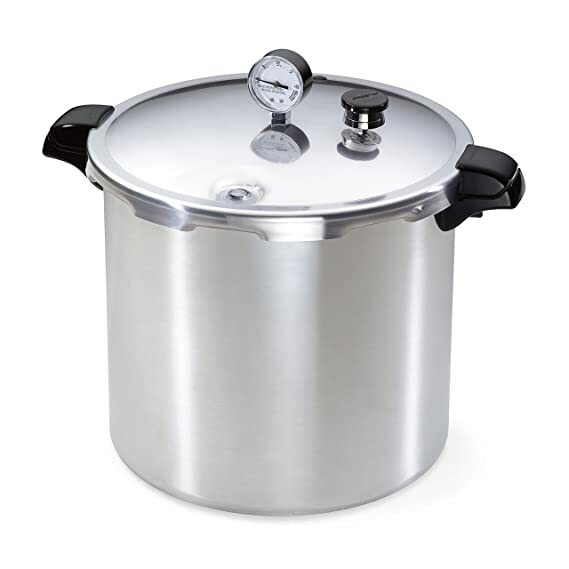 Best Pressure Canner Reviews and Guide – 2019: Canning is a method of food preservation in which food stuff is sealed in an airtight container. Canning food extends the shelf life of a product by a significant amount. Some freeze-dried products can last up to 30 years in an edible state without any added preservatives. Canning is a great way to preserve food that is seasonal in nature and enjoyed throughout the year. One way to can foods is to use the pressure canner. A pressure canner is essential if you want to preserve low acid food like seafood, red meats, most fresh vegetables other than tomato, and poultry. Since these foods have a low pH value, they don’t inherently kill any bacteria that gets stored with them and the normal water bath canners only reaches temperatures of up to 212 F which doesn’t get rid of the bacteria either. This is because the temperature of the food must be maintained at 240 F, for a specific amount of time, in order to kill all the harmful bacteria. This is easily achieved in the pressure canning method due to the build-up of steam in quality pressure canners. In fact the U.S.D.A recommends pressure canning as the only canning method to preserve low acid food. Though how does one decide which pressure canners are good? What factors should you keep an eye out for in a good pressure canner? Worry not, for we have compiled a small list of factors to guide you in buying the best pressure can that you have. Based on this list we also have reviewed the best pressure canner out in the market to make it easier on you to choose one product. While there are several manufacturers for pressure canners around in the market currently, the two that are the most reputed and widely regarded as the best are Presto and All American. They are generally more expensive than most other brands but their quality cannot be argued with and they are built extremely sturdy. The most common size for the vessel of the pressure canner is around 23 quarts to 16 quarts which usually can hold around seven quart jars. Pressure canners which are larger than 23 quarts can hold up to 14 quart jars per batch. It’s easy to stack the jars in a pressure canner, unlike in a water bath canner, which lets you can more jars per batch. Since the canning process is much longer when you’re using a pressure canner, because of the time required for heating up, cooling down, and venting, you’ll most likely want to do multiple jars in a batch. With a bigger capacity canner you can easily circumvent this drawback as you’ll be able to can many more jars per batch than you could with a water bath canner. And don’t worry about needing to completely fill the canner each time if you buy a large pressure canner. You can just use it to seal one jar or up to its maximum capacity. The smallest pressure canners usually hold up to 4 quart jars per batch. Your ideal size for the canner will depend on your frequency of use and requirement though we would recommend to go for a bigger one as a general rule of thumb. Do not try to use saucepans, or especially regular pressure cookers to try the canning process. Pressure cookers are nowhere as sturdy as pressure canners. Their walls are much thinner than pressure canners, and the build-up of immense pressure inside can lead to catastrophic failure, resulting in rupture of the pressure cooker. There are mainly two types of pressure canners depending on the way they regulate the pressure inside the kettle. The first is the dial-pressure gauge and the other is the weighted gauge regulator. The former requires one to constantly adjust the heat source to maintain the optimum pressure inside the kettle. The latter relies on a weight based valve release that lifts up and releases excess pressure, working sort of analogously like a pressure cooker. The weighted gauge pressure canners release small bursts of steam from inside the kettle as the gauge, a small weighted round or disk that is situated on the port vent, moves and jiggles during the canning process. The weighted gauge pressure canner is almost completely “automatic”, as one doesn’t have to hover over it and check it during the canning process. As long as you can hear the gauge move and jiggle, it signifies that the pressure canner is working properly. However, one drawback of weighted pressure gauge canners is that most of them correct for any changes in pressure due to altitude changes. In a dial gauge pressure canner, it has a measurement dial attached to the lid of the canner which shows how much pressure is there inside the kettle. This means that during the canning process you have to monitor the canner to ensure that there is always adequate pressure inside the kettle. Usually changes are made by adjusting the heat source. Also, always remember to maintain the accuracy of your dial gauge by checking it regularly. A margin of error around 2 is acceptable when measuring at 11 lbs of pressure but anything more than that means that you need to either replace your dial gauge or calibrate it. Usually canners will come with instructions on how to accurately calibrate their pressure gauge dials. Maintaining optimum pressure is essential to ensure your food not over processed, ruining the taste and texture or/and it’s not under processed which can result in unsafe food stuff. While we would generally recommend weighted gauge canners some people prefer using dial gauge canners. Also weighted gauge canners wouldn’t be our first choice if you live somewhere with an elevation of higher 1,500 ft since that would require adjustments in your canning process to maintain adequate pressure. The final thing to take into consideration is the price of the pressure canner that you’re looking to buy. A pressure canner, ideally, should last over a very long period of time. So, even if you are spending a lot up front, most of the cost will be returned from the value of the pressure canner through, potentially, decades of use. 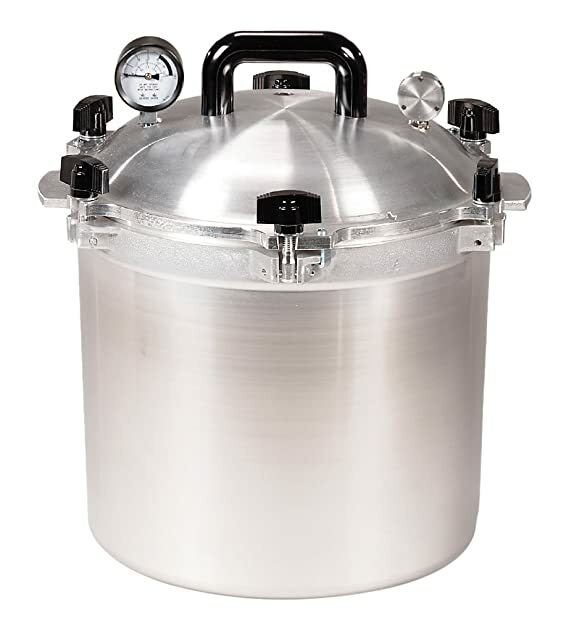 A pressure bath canner can also be used as a water bath canner (just omit the lid). For this reason, don’t be too intimidated by a high price point since it should be something you invest in once and not worry about for several decades. The price range for pressure canners is anywhere from $80 to $500 for most standard designs. Those are the four major things to keep in consideration while buying a pressure canner. This amazing product from All American is the best choice in the market currently. Coming in various sizes, all the way form 10.5 qt to 41.5 qt. The more standard, 21.5 qt kettle can hold around 7 quart jars or about 19 pint jars. The canner itself is made out of hand cast aluminum. The product has an easy to clean and attractive looking satin finish. The lid has an easy release and clamping cover with positive action clamping wing nuts. The lid handle is a sturdy Bakelite product from Phenolic. You also don’t need to worry about any gaskets with this product as the sealing mechanism is a unique metal to metal sealing system which allows no steam to get out. On top of the lid, the All American 921 has a very prominent and easy to read geared steam gauge. The steam gauge automatically releases any excess pressure from the inside of the kettle. It comes with three standard settings of 5 psi, 10 psi and 15 psi. As an added safety measure, it also features two automatic venting ports instead of just one. One of them is the safety control valve and the other is the overpressure plug. The 921 also has double thickness in pressure points that have the most wear and tear. This provides added protection. The All American 921 is the best pressure canner in the market currently and the one we would wholeheartedly recommend to any of our readers. Presto is another reputed brand in the pressure canner market apart from All American. The 01781 from Presto is a great product for an amazing price which comes in two varieties, one standard and one which is compatible with an induction cooker. 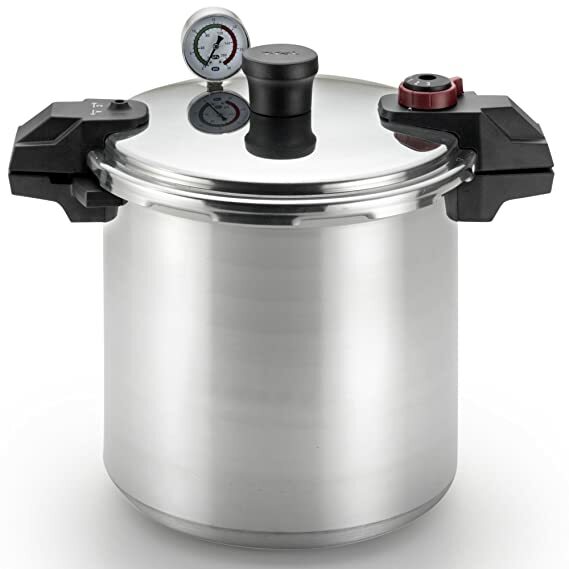 This pressure canner can also be easily used as a water bath canner and a spacious pressure cooker. The capacity on this Presto pressure canner is 23 qt which can easily fit 7 standard quart jars or 20 pint jars. It is outfitted with an easy to read gauge which automatically measures the pressure so that the pressure can be maintained at a constant spot during processing. There is an overpressure plug which lets out off excess steam. This is in addition to the simple steam release mechanism. The Presto comes with a recipe book that contains over 50 different recipes that you can try with your new pressure canners, making sure that you start using the pressure canner without any issue in no time. The construction itself is sturdy as it is made from extra strong aluminum and is suitable for use on most regular and smooth top cooking ranges. The pressure canner also comes with a 12-year extended warranty to ensure that you get the best return on your canning investment. Constructed from rust proof heavy gauge aluminum, this pressure canner from Mirro is available in two sizes, 16 qt and 22 qt. The bigger size can accommodate around 16 pint jars, and 26 half pint jars (if double stacked) and 7 quart jars. It comes with three pressure options at 5 psi, 10 psi and 15 psi for easy use and minimum fuss. Allowing you to not worry about maintaining optimum pressure in the pressure canner manually. It has a reusable overpressure plug, to let off any excess steam beyond your requisite pressure setting. A sure locking lid system which makes sure the lid doesn’t open accidentally and stops any spill from occurring from built up pressure inside. And a side gasket pressure release system that also makes sure that all the steam required for processing doesn’t escape during the process. Finally, it comes with a set of racks, an instruction manual, a recipe book, a limited 10 year warranty on the pressure canner and a 1 year limited warranty on any replacement parts. 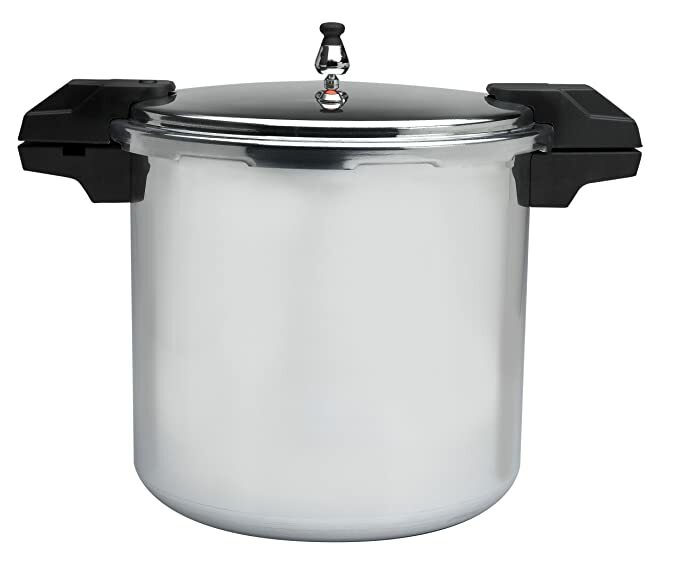 This 22 qt pressure canner from T-Fal is made out of polished aluminum. Intended for use over stove top ranges, it can function both as a pressure cooker and a pressure canner. It comes with a deluxe pressure gauge dial and 3 selective cooking pressure options, 5 psi, 10 psi and 15 psi. It has an overpressure plug that easily lets out any excess steam which prevents any catastrophic ruptures in the pressure canner. The polished aluminum is entirely made out of heavy gauge, rust proof aluminum. Just like the Mirro, this pressure canner also comes with a sure locking lid system which functions almost the same as the one in the Mirro. It comes with a pressure monitoring device built in to the handle itself. With two cooking racks, you can process either 26 half pint jars, or 16 pint jars or 7 quart jars into this pressure canner. You also get a recipe book, a 10 year limited warranty on the kettle and 1 year replacement warranty on other parts on the canner. With that we have come to the end of our list of the best pressure canners currently in the market. The pressure canner is an incredibly versatile and useful tool that one can use to enrich the lifespan of food products without sullying their health with any added artificial preservatives. While canning can seem like a menial task that one has to sit through, when you’re enjoying your blackberries in the winter or some melon in the middle of autumn, you would love yourself for canning those fruits up. And it’s not just fruits or vegetables that you should be processing. With the pressure canner, you can easily can most if not all items that you can think of. Though do remember, never use any canner on any open flame or any heat source that is hotter than 12,000 BTU unless the manufacturer explicitly have said that it is safe to do so. We hope that our guide has helped you in identifying what features you should be considering before selecting a pressure canner for your own use. 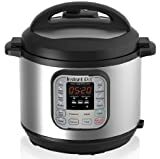 With this new information in mind you can go out and research on the best pressure canner for your own needs or you can choose from the list of the best pressure canners that are currently available. We hope that our article has helped and guided you. Happy Canning!